See Habesha’s full menu further down this post, or click here to jump to it now. 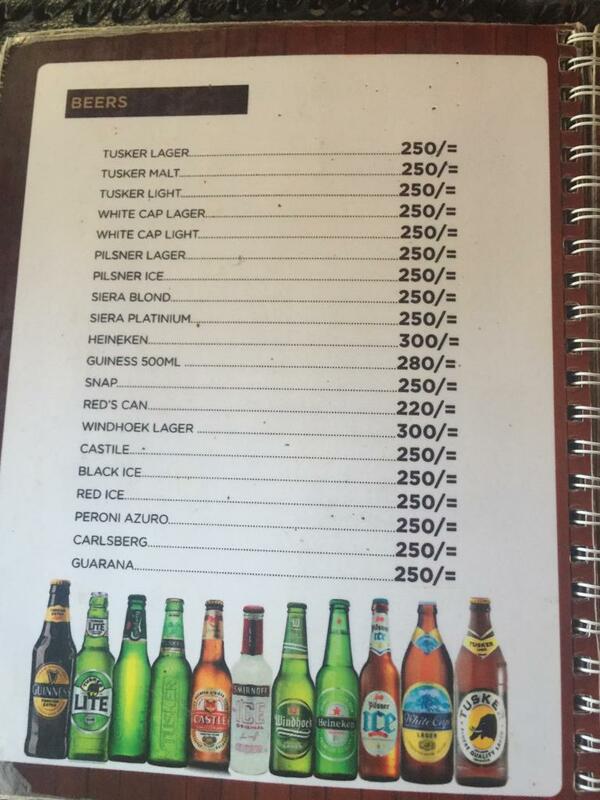 Today, I would like to tell you about a regular eating spot of mine: Habesha Ethiopian Restaurant & Bar. 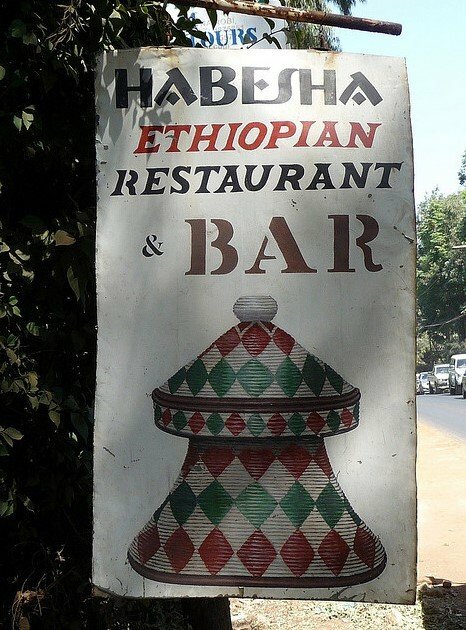 Habesha, where I find myself at least once or twice a week, is located on Argwings Kodhek (on the right hand side before the intersection with Elgeyo Marakwet when coming from Yaya), and is the Ethiopian restaurant of choice for many people who live in its environs. 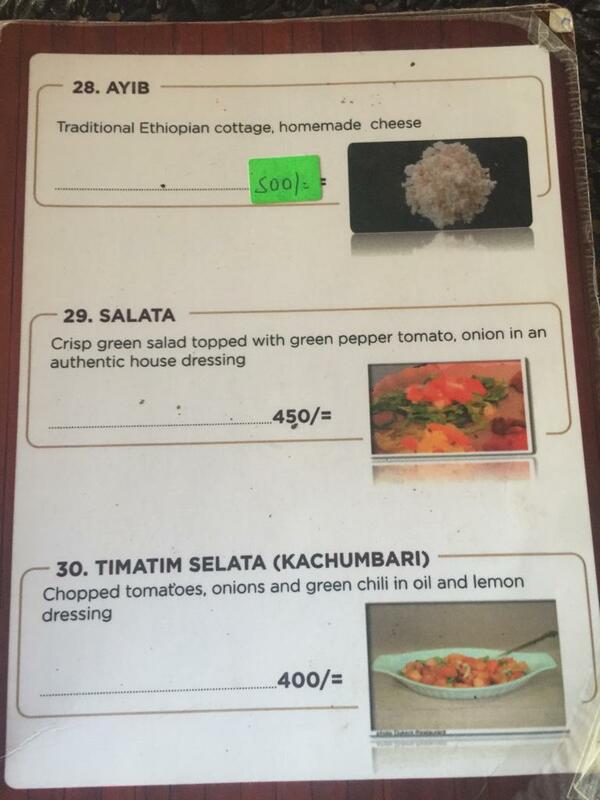 I first learned of Habesha from an Ethiopian workmate who told me that it was the preferred Ethiopian restaurant for Ethiopians living in Kenya. My colleague decided to take me to Habesha for the first time after I told him that, despite being an avid fan of Ethiopian food, I had never tasted the raw meat that is such a famous part of Ethiopian cuisine. We promptly made a date for the following Thursday so I could sample this raw meat. Our rendez-vous took us to Habesha, where he used to have lunch with a group of his friends, faithfully, on a certain day each week. 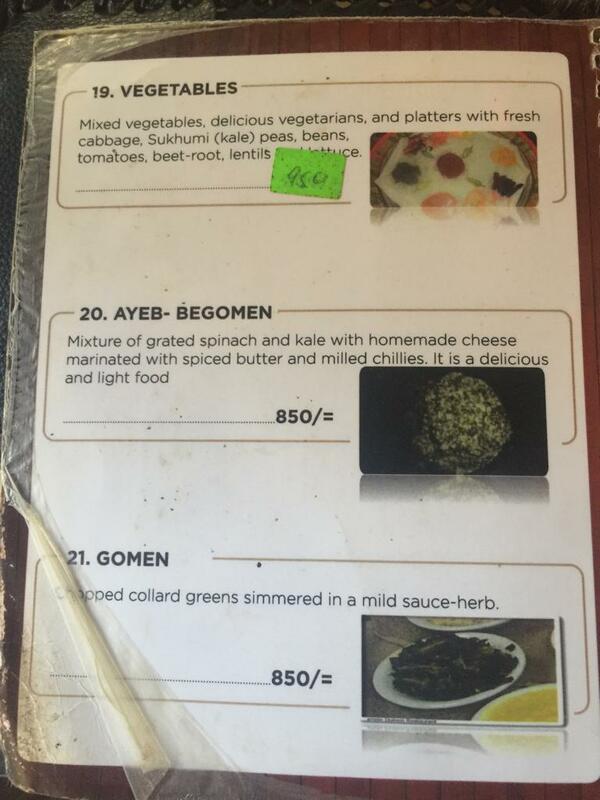 Once we got there, my workmate ordered a slew of Ethiopian delicacies, including special Kitfo, raw minced meat accompanied by Ayib Begomen, a mixture of kale (sukuma wiki) and homemade cheese. We ate our Kitfo raw, or more accurately ‘leb-leb'( which means slightly heated in order to remove the chill from the meat and to melt the butter with which it is prepared). Kitfo can also be eaten partially cooked or well done (not anything to write home about when it is fully cooked). Much to my surprise, I thoroughly enjoyed it. Kitfo is not the only thing of note at Habesha. The entire meal we had that day, which consisted of several sauces, or wots, and Injera, fermented bread usually made of teff, was outstanding. On my visits to Habesha now, I very rarely eat Kitfo because my company usually isn’t as daring as I was that first day. Instead, I have the mixed meat platter, or one of the single dishes, such as the Key Wot or Minchet Abish, accompanied with Ayib Begomen, a personal must! 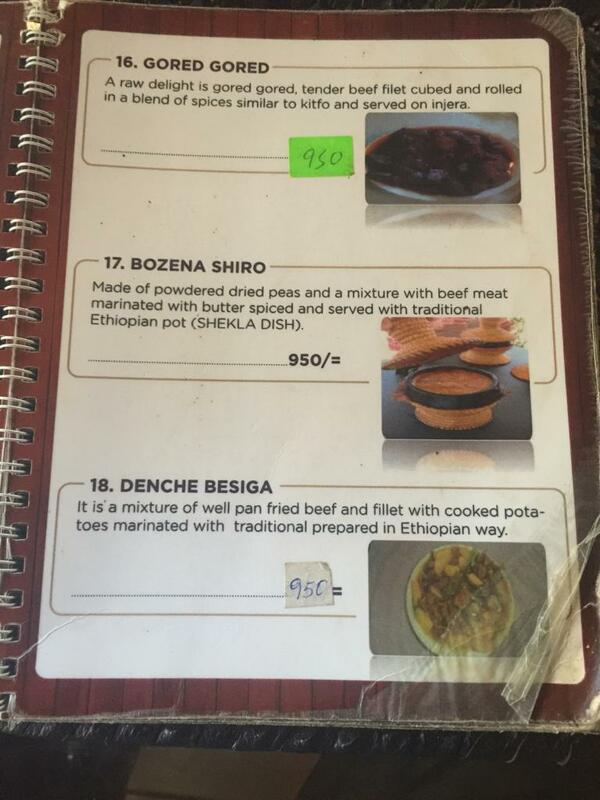 The food at Habesha is well priced with a dish averaging about Ksh. 1000. 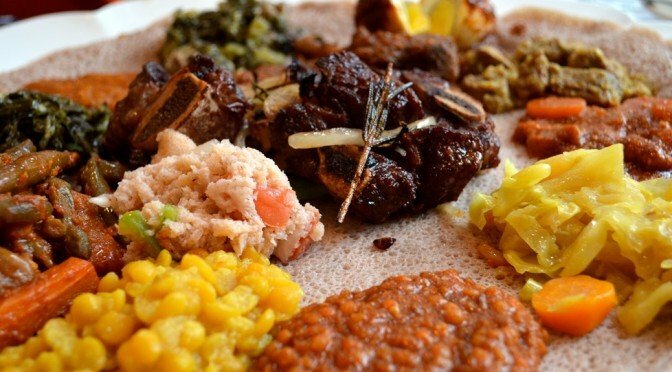 All accompanied by Injera, each dish easily feeds 3 to 4 people. If you have never tasted Ethiopian food before, I recommend it highly. It is extremely tasty, and at Habesha, well priced. 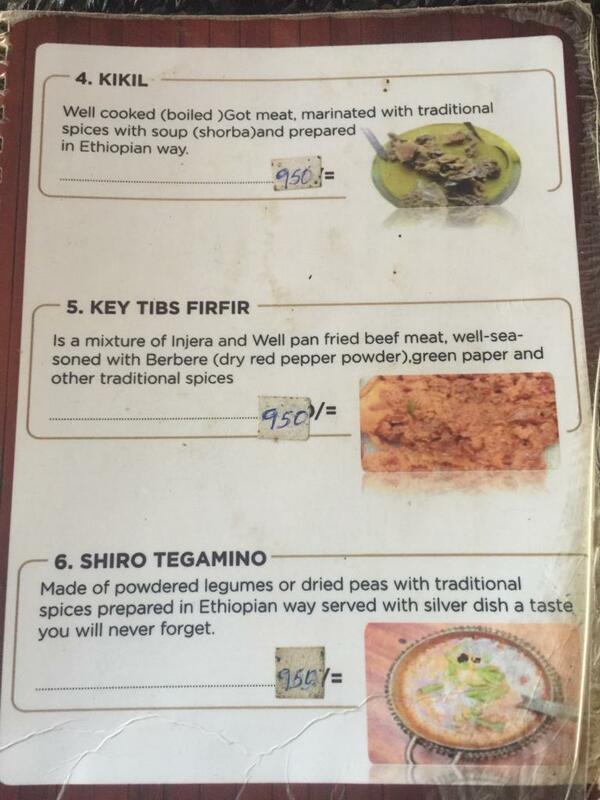 Ethiopian food tends to be very spicy, but it can also be made mild upon request. For a first time, I recommend a mixed meat or vegetarian platter to get an idea of the general cuisine. Once you’ve tasted a few dishes, you can then begin to order single dishes more confidently. 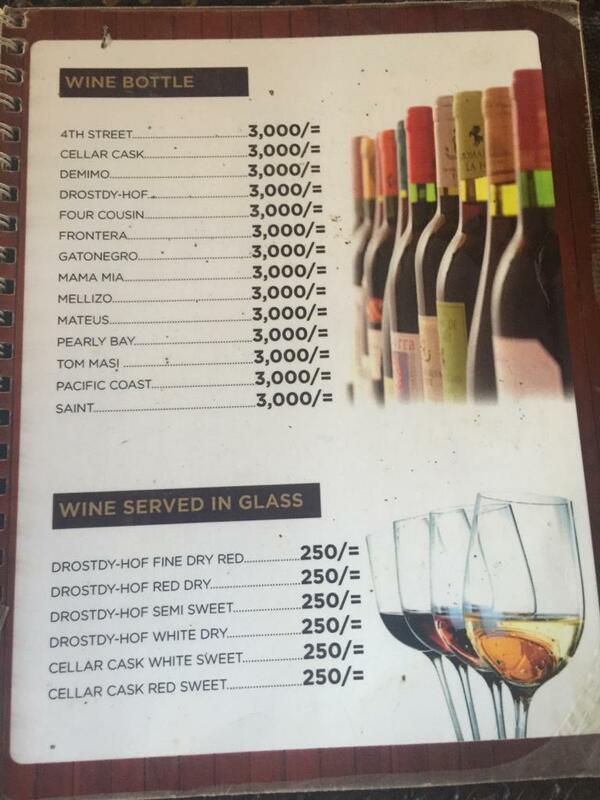 See Habesha’s full menu below. Habesha Ethiopian Restaurant serves food all day, and so serves both lunch and dinner. I prefer to go to Habesha for lunch (rather than for dinner) for two reasons: 1) Ethiopian food is extremely tasty and is usually served in large quantities so overeating is almost inevitable (which I prefer to do earlier in the day, if at all) and 2) Habesha has great outdoor garden seating that is great for soaking up some sun. Whenever you choose to go, and whatever your order, I recommend also including a portion of Ayib Begomen. This cheese and vegetable complements all the other dishes perfectly! 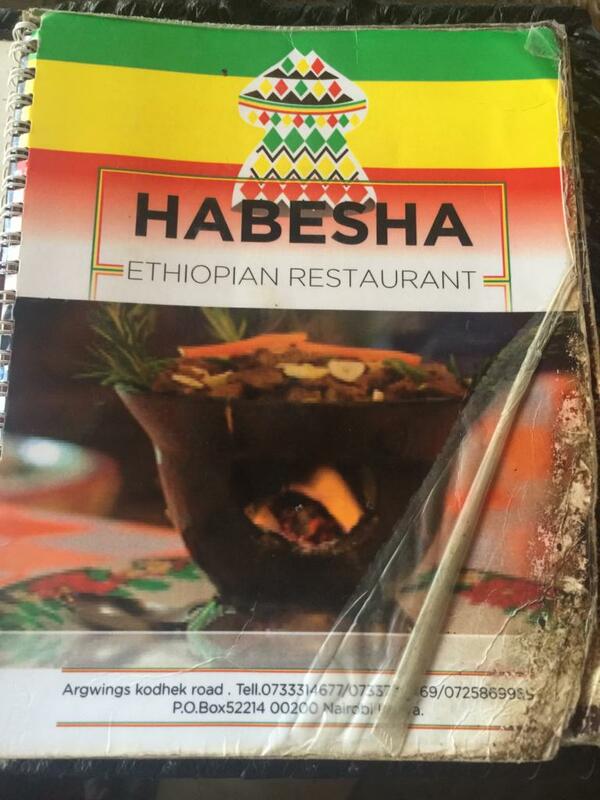 I hope you do have a meal at Habesha Ethiopian Restaurant soon. When you do, I would love to hear what you have to say. Don’t forget shirow, zilzil tibs, and our NPA specialty Dr Elias tibs! I will try your suggestions as well. Habesha is the best! Hi! just discovered your blog and am happy to see that all my favourite places are here! Habesha is also one of my regulars, and wouldn’t be complete without shirow (mild chickpea stew) and zilzil tibs (roasted beef with rosemary), and a personal fave, Dr Elias tibs (beef with onion). Will look through the rest & you’re already bookmarked! Keep it up! 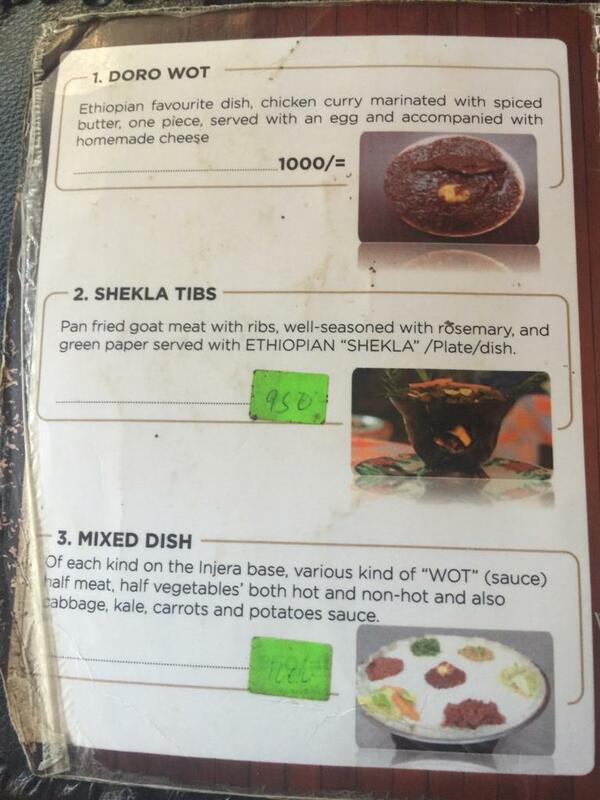 Is there really a dish called Dr. Elias Tibs? I’ve never tried that. Like you, I love Shiro too! Eating tibs at an Ethiopian restaurant always leaves me feeling hoaxed though. 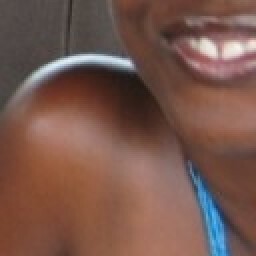 It seems to me that its simply nxama choma!  Two tib dishes that I’ve tried recently were Biten Tibs (cooked in a light sauce) (sp?) 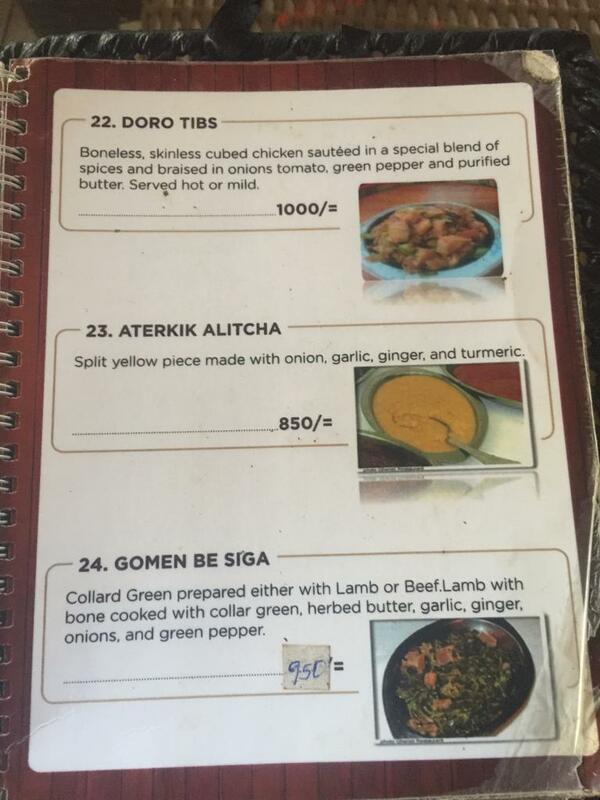 at Pink Lady in Hurlingham, and Doro Tibs (chicken tibs)at an Ethiopian restaurant in Dar, ‘Addis in Dar’. Those two I found outstanding. Try those if you get a chance. Great blog! 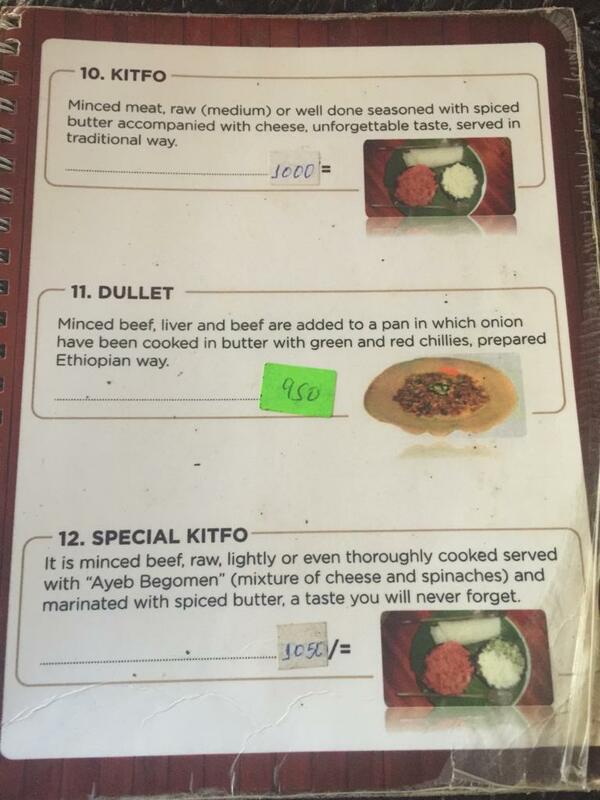 I love Ethiopian food too. In fact, in the town where I live there’s several Ethio restaurants, and my friends and I go around town sampling the best. 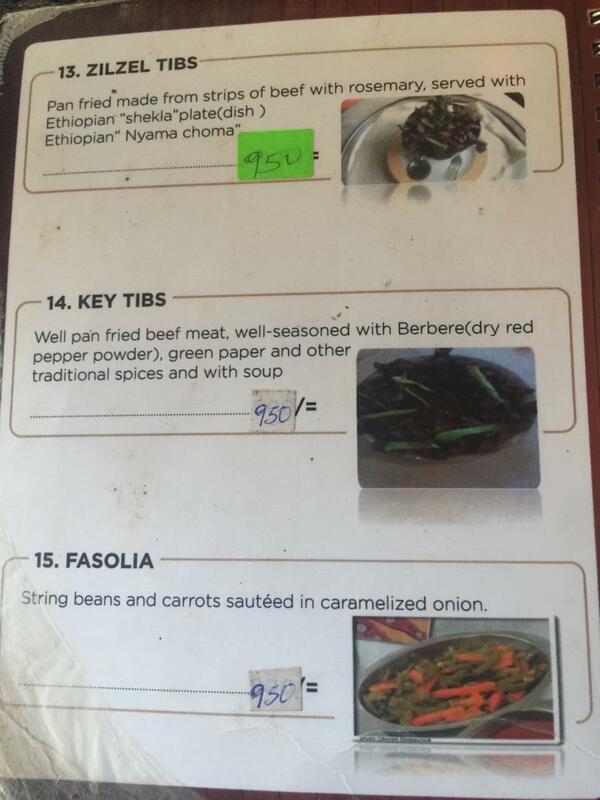 My favorite dish is Ybeg Key Wot (lamb cooked in Berber sauce), while my boyfriend’s is the Yebalager Tibs). 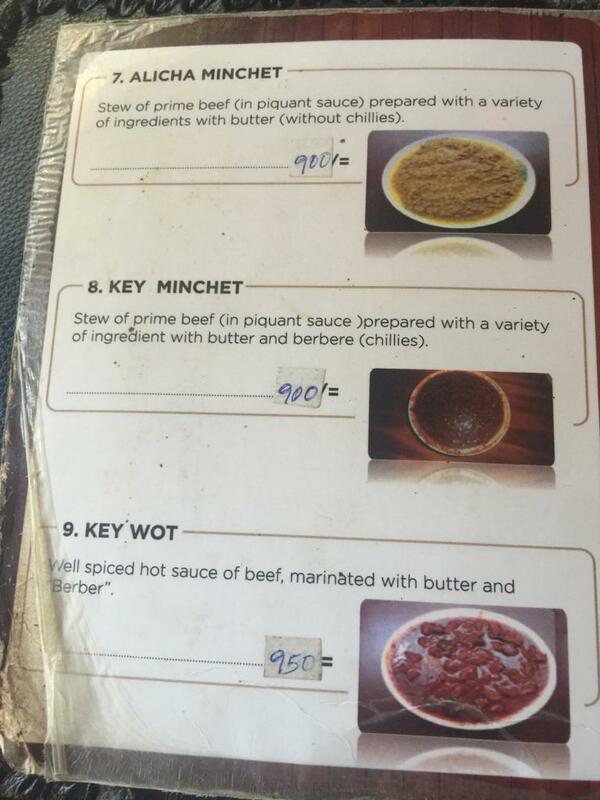 I am yet to try the Kitfo. yummy yum… I know I am headed their for lunch tomorrow! 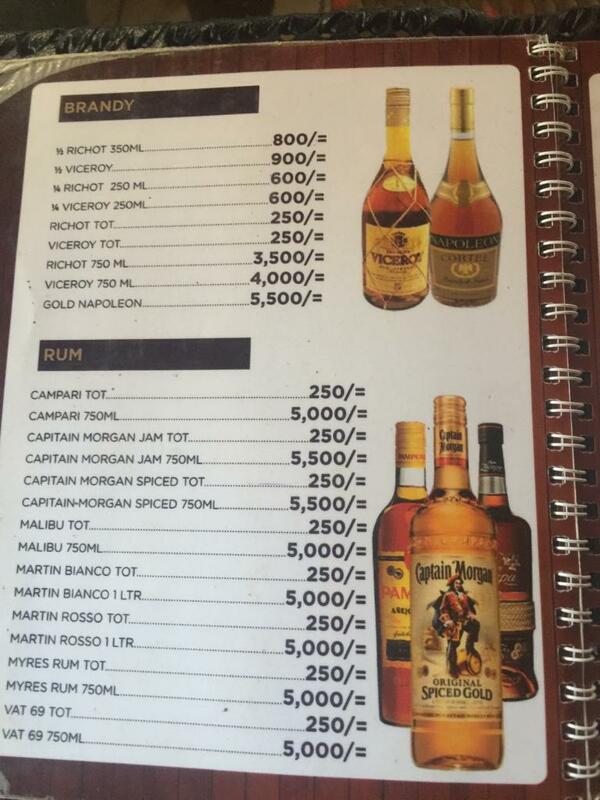 Ha, ha…Majonzi. I see we share a passion, and I hope you enjoyed your planned lunch! Welcome to ChickAboutTown. Please come back often! Out of curiosity, what town is this? Any restaurants you’d like to recommend to us particularly if ever we are in your town? Village Market Cinema: Have You Noticed How Expensive Movies Have Become?